Classic and popular is Parkhurst's 1959-60 effort, with this ensemble featuring very few creases and some appealing star power, much of the latter in EX-or-better condition. 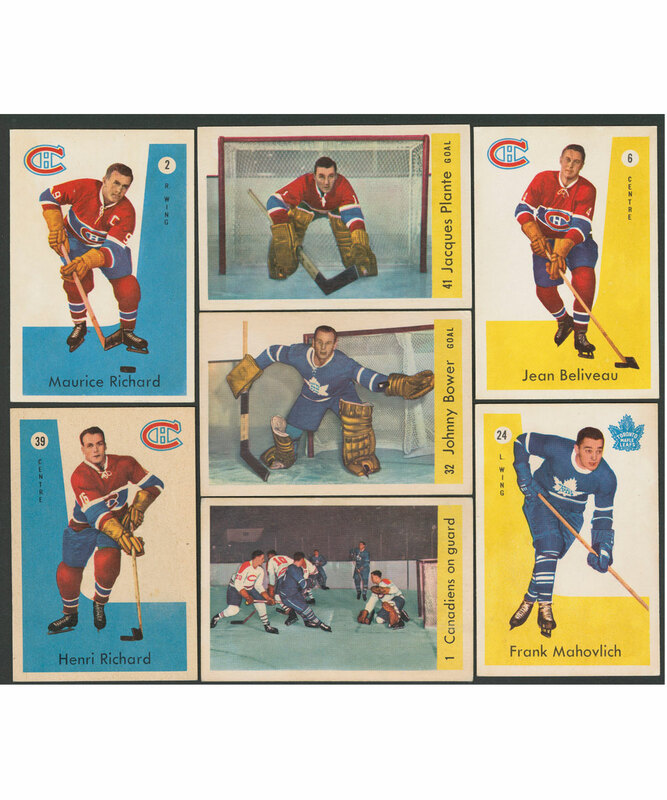 Terrific coloring and centering are observed on the EX-MT Jacques Plante card, with 39-Henri Richard also EX-MT with light toning. The whiteness/brightness of 6-Beliveau is striking, with 2-Maurice Richard and 32-Johnny Bower also EX+, while 24-Frank Mahovlich (EX), 23-Tim Horton (VG-EX+) and 1-Canadiens on guard (VG+) are also noteworthy. Among the rest, seven EX-MTs lead, (16-Hodge, 20, 25-Bower in action, 27-Blake, 36-Smythe, 38-Duff, 48) and we then count 13 at EX or EX+ (31-Hicke RC, 44-Stanley). 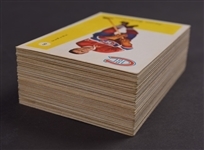 In the VG+ and VG-EX realm are 15 cards, including 3-Brewer RC, 5-Chadwick, 7-Armstrong, 14-Moore and 33-Geoffrion, while at VG are the remaining seven, with 8-Harvey, 15-Imlach RC, 50-Clancy and action cards 30 and 46 among them. Overall, rather attractive '59-60 Parkies for a vintage collectibles shrine.